Volunteers are key members of the hospice and palliative care team. In some countries, they are the only source of care provision for a person at a palliative stage of a disease. This chapter highlights both the importance of volunteers in these settings and the impact their contribution makes to care. 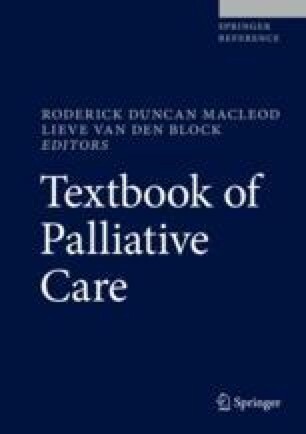 The chapter covers the definitions of volunteering, the historical development of volunteering in hospice and palliative care, as well as research evaluation to document volunteer practice, an understanding of their distinct role in patient and family care, and assessment of their impact on patients and their families experience. The chapter also provides five case studies from volunteers across the world on their experiences in volunteering. European Association of Palliative Care. Voice for volunteering. The EAPC Madrid Charter on volunteering in hospice and palliative care. Available from: http://www.eapcnet.eu/Themes/Resources/VolunteeringCharter.aspx (accessed 12th June 2018); 2017. Pawłowski L, Lichodziejewska-Niemierko M, Pawłowska I, Leppert W, Mróz P. Nationwide survey on volunteers’ training in hospice and palliative care in Poland. BMJ Support Palliat Care. 2016. https://doi.org/10.1136/bmjspcare-2015-000984. Scott R. Strategic asset or optional extra: the impact of volunteers on hospice sustainability. Unpublished doctoral thesis, University of Dundee. Available from http://ethos.bl.uk/OrderDetails.do?uin=uk.bl.ethos.585509; 2013. United Nations. State of the world’s volunteeerism report: Transforming Governance. United Nations Volunteer Programme. Available from: https://www.unv.org/sites/default/files/2015%20State%20of%20the%20World%27s%20Volunteerism%20Report%20-%20Transforming%20Governance.pdf; 2015. World Health Organization. WHO definition of palliative care. 2018. Available from: http://www.who.int/cancer/palliative/definition/en/.